President Trump is directing U.S. Trade Representative Robert Lighthizer and National Economic Council Director Larry Kudlow to begin negotiating for the United States to join the Trans-Pacific Partnership. ARLINGTON, Va. — U.S. Wheat Associates and the National Association of Wheat Growers are very happy to learn that President Trump is directing U.S. Trade Representative Robert Lighthizer and National Economic Council Director Larry Kudlow to begin negotiating for the United States to join the Trans-Pacific Partnership. 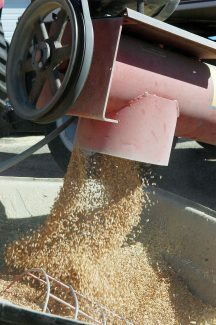 "Putting it simply, joining TPP is the best way to avoid a potentially devastating loss of wheat sales to Japan," said USW Chairman Michael Miller, a wheat farmer from Ritzville, Wash. "If the United States joins TPP, U.S. wheat should be able to compete on a level playing field with Canadian and Australian wheat, which will soon have a major advantage once TPP is implemented. That would keep U.S. wheat sales that currently represent 50 percent of Japan's total wheat imports competitive in this crucial market." "It is very encouraging that the president is taking this step," said NAWG President Jimmie Musick, a wheat grower from Sentinel, Okla. "If we can find a way to join this trade agreement, it will go a long way toward helping protect the incomes of every American wheat farmer. We also want to thank the members of congress who pushed very hard to see this opening."